The tallest man in Europe, 7ft 7in former basketball player turned actor Neil Fingleton, who played roles in Game of Thrones, and the X-Men and Avengers films, has died aged just 36. Such early death in the excessively tall is not uncommon. Robert Wadlow, the world’s tallest person on record died at 22, and of the 10 tallest people ever recorded, the oldest died at 56. In people, height is negatively correlated with longevity; that is, taller individuals don’t tend to live as long. It’s kind of unfortunate that I’m both a researcher into ageing and 6ft 1in tall. While these are extreme examples, in the general population there also is a trend of greater height leading to reduced longevity. For example, taller woman are more likely to suffer from cancer in later, post-menopausal life. In a study of civil servants at Whitehall, height was noted as an excellent correlate with risk of cancer, stroke and cardiovascular disorders, and ultimately death. Yet it’s a noted rule of thumb in the biological sciences that bigger species of mammals live longer – for example, elephants (lifespan: 40 to 75 years) and whales (35 to 110 years) – than smaller ones – for example, mice and rats (around 12 months). 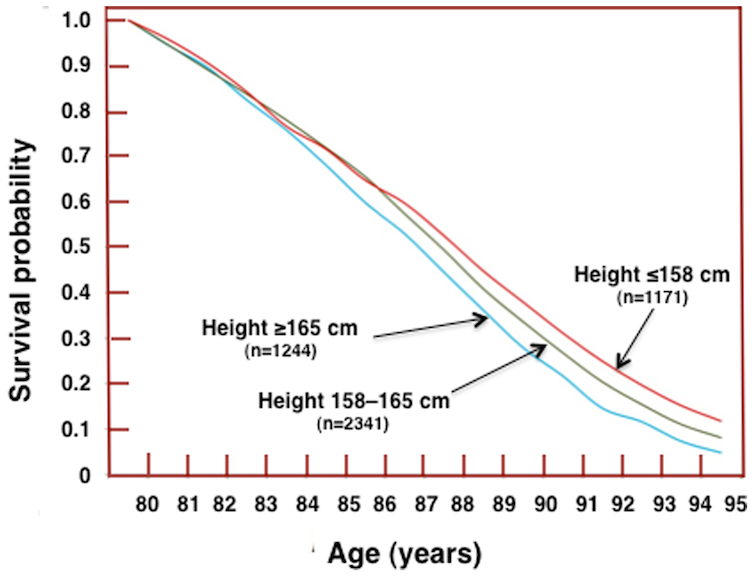 So why is height not associated with longer life spans in humans? As a researcher into ageing, for me the important question is why does height, such a useful day-to-day feature, and arguably an evolutionary advantage for our hunter-gatherer ancestors on the savannah, seem to count against us? There are two good hypotheses here, one arguing the case for nature and the other for nurture – but it may be that they are linked. On the nurture, environmental factors side of the argument, there has been a lot of research conducted recently on the idea that reduced calorie intake (eating less) can correlate with greater longevity. Essentially, faced with restricted quantities of available food, animals tend to live longer. We have found good evidence for this in worms, mice, dogs, monkeys, and there are even suggestions of the same effect in humans. Indeed, children who lived through the Second World War and rationing show a bump in longevity statistics. Why does this matter? Because these calorie restricted worms, mice, monkeys and children are also shorter than their well-feed peers. So average height across a population is a rough marker of calorie availability during childhood and development, which is a factor that decides height in adulthood. On the nature side of the argument, it might seem obvious but genetics dictates height as well. Even my above average height makes me the shortest member of my family, with a brother, mother and father who are all taller than me. 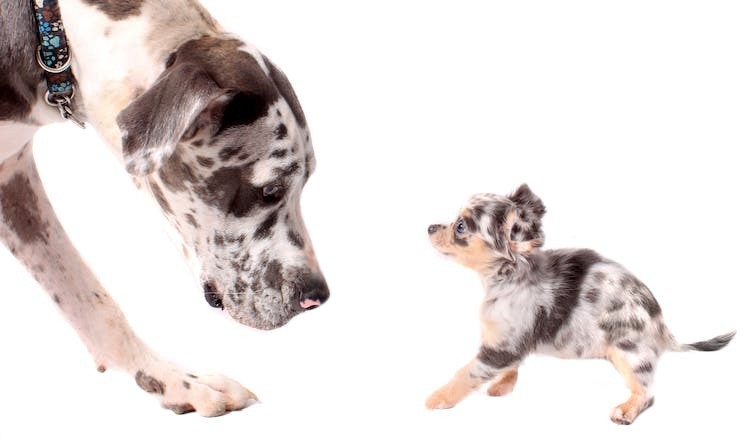 So-called “familial height” is passed on via genes that contribute to height. In particular, the conveniently named and easy to remember gene Forkhead family, O subclass, type 3 gene (FOXO3), has a common variation that is associated with longevity in worms, in flies, and in human centenarians. This gene has many roles, contributing to stem cell activation, controlling cell death mechanisms, and altering the effectiveness of insulin and insulin-like growth factors. All of these play a role in how the body senses how much energy it has, and so how much growth it can afford over and above the nutrients and energy the body needs just to maintain itself. So variation in this FOXO3 gene may also contribute to this hypothetical connection between longevity, height and calories by directing more or less energy into growing the body. So while tallness is linked to shorter lifespans on average, we don’t really understand why. There’s some good research at the moment regarding both genetics and lifestyle, which may reveal that simply eating a little less over the course of your life may lead to a longer life. A simple sounding fix – but getting people to eat less has not always proven easy.